Traditionally flowers here are generally given amongst family members at religious holidays, however in big cities it is becoming more & more common for gifts to be given on Birthdays, Anniversaries & Housewarming. For most Bangladeshis, it is the thought rather than the value of the gift that is important. Avoid giving white flowers or frangipanis as these are typically reserved for funerals. The national flower of Bangladesh is Shapla (White Water Lily) & is surrounded by two sheaves of rice. Above the water lily are four stars and Three Jute leaves. Remember it’s considered impolite to open gifts in front of the giver. Typically, gifts are given with two hands. When visiting a Bangladeshi's home, it is more common to bring flowers with pastries, sweets or good quality chocolates. Roses, Lilies, Gerberas are some of the favourite flowers that are gifted here. Send flowers same day to Bangladesh using our local florists & flower shops. Order by 12 noon. Send Mother's Day Pink Roses, Lilies, Carnations & Special Gifts to Bangladesh. Send Roses, Carnations, Lilies throughout Bangladesh for occasions like Birthdays, Anniversaries, Funerals, etc. Enjoy affordable flower delivery across Dhaka, Chittagong, Khulna, Rajshahi & nationwide delivery. How do i send International Flower Delivery to Bangladesh? 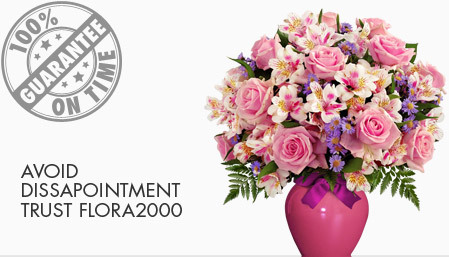 Flora2000 has transformed International flower delivery to Bangladesh into a fine and effortless art. With our efficient flowers & gifs delivery services worldwide; you are sure to find the perfect expression of your message to your loved ones. Be it Roses, Lilies, Carnations or Cakes, our gifts are sure to make both the sender and the receiver happy. We make sure the gifts you give reflects what you feel about the receiver. Handpicked Unique Gift Ideas for Mom. Fresh Roses, Lilies, Carnation & Gift Hampers specially crafted for your mum. Order NOW for guaranteed delivery on Mother’s day in Bangladesh.